Children who fall behind at school before the age of seven are likely to stay behind, a charity has warned. 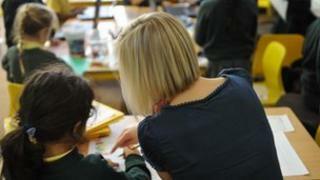 Save the Children analysed 2012 data on the performance of pupils at schools in England. It shows the poorest pupils are less likely to have made good progress than their better-off peers. The charity's chief executive, Justin Forsyth, said: "Many children starting school this term already have the odds stacked against them." In his foreword to the report, he writes "Seven is too young to write off a child," but he adds that without good reading skills "all other subjects are a closed book". The report cites official figures that suggest that by the age of seven the future gap in GCSE results between rich and poor children has already been established. In 2012, about 13% of seven-year-olds, or 76,000 pupils, were not at the expected reading level. Underlying this figure is the achievement gap between children on free school meals and their classmates. Almost a quarter (24%) of children eligible for free meals did not reach the expected level, compared with only 10% of children from better-off families. A different set of figures from the 2012 National Pupil Database shows that fewer than a sixth of pupils who had fallen behind at the age of seven caught up to meet the benchmark of five GCSEs graded A* to C at the age of 16. This suggests that 84% of children who fail to meet expected standards in reading and mathematics at seven are likely to continue to struggle throughout their school careers. The authors recognise "steady and welcome progress" over the past five years on the number of seven-year-olds who can read and write to the expected level. Their analysis has found that even continuing to make this rate of progress between now and 2020 could still leave almost half a million children having fallen behind in their reading by the age of seven. They add that continued progress may be difficult to achieve so even these figures may be optimistic without "bold policy change". Calculations based on lower rates of progress suggest that between 520,000 and 810,000 children could have fallen behind by 2020. A Department for Education spokeswoman said: "It is utterly unacceptable that so many disadvantaged children leave primary school without a firm grounding in the basics of reading, writing and maths and that is why we are urgently reforming primary education and giving specific support to disadvantaged pupils." This included the pupil premium paid to schools to support poorer pupils, the phonics test and the "rigorous new primary curriculum" which would mean that "many thousands of children will now receive the extra support they need to catch up with their peers." Save the Children is launching a programme called Born to Read, aiming to help about 23,000 children in England to read over the next four years.